All of our organs change as we age and unfortunately the changes are usually for the worse. For example, there is a decrease in reserve capacity in the lungs, kidneys and heart. The changes in the brain are no exception and even in people without actual brain degenerative diseases like Alzheimer's, there is a general trend of deterioration in many brain functions. What's Going on in the Ageing Brain? By the time that we reach young adulthood, our brains are biologically mature. Even after that, our brain functions are involved in continuous adaptation to environment and personal development. Some cognitive functions, particularly higher level abilities, keep getting better until middle age, but others start to decline even in the mid 30s. Beyond middle age, there is a gradual deterioration in elements of memory, attention and information processing, that some see as due to an overall slowing down of cognitive functioning. Other researchers do not subscribe to this hypothesis that all brain functions slow down at the same rate. They argue that aging mainly affects some very specific functions, like certain types of information processing, which take part in many cognitive abilities. This may make it seem as though all cognitive processes have declined, though some may still be quite unaffected by age. Memory deficits seen in those with both normal ageing and those with Alzheimer's disease have been connected to decrease in the volume of certain brain structures, for example an area called the hippocampus. Genetic markers have also been found to have importance. One study found a kind of "genetic signature", whereby certain specific gene changes were detected in ageing brains. Genes most reduced in the ageing brain were those dealing with learning and memory and those with most enhanced expression were involved in stress and repair mechanisms. In some people, these changes started as early as in their 40s. Interestingly, brain gene patterns were quite similar among young adults and among the very old. But, in the 40 -70 age group, patterns were far more variable, which suggests that people's brains age differently during middle age. What Are Age Related Cognitive Changes? The term "fluid intelligence" means the ability to keep your attention on the task at hand. Abilities that depend on this capacity tend to decline as we age. Other related difficulties may occur with understanding text, making inferences and spatial cognition. Memory may be affected in a number of ways, sometimes quite subtly. For example, there is overall reduction in the ability to encode new memories, to retrieve old ones and to use working memory, without losing track of information. Age related decline in all these functions seems to be most marked when conditions are complex or a task is unfamiliar. Many of these factors may come into play when dealing with technology, for example leading to problems with selecting task targets on complex displays like overcrowded websites. "Crystallised intelligence" means learned knowledge and habitual procedures, which tend to hold up well as we age. Abilities that don't seem to decline include implicit memory, a term which refers to all the things in our memory banks that can't be brought to mind but influence our behaviour on a subconscious level, and prospective memory, which means remembering things that need to be done. Picture recognition abilities also don't seem to suffer with age and neither do expert skills that may have taken a lifetime to perfect, like chess or bridge playing and typing. So, strategies to help older adults may involve use of pictorial aids and reduction of distracting, irrelevant information that they find harder to screen out than younger people would. On a positive note, when we look at the overall perspective, a vast majority of the elderly are sharp and creative. The fact that they are a little slower at some tasks than they were in their youth impacts only minimally on their lives. Scientists using MRI scans to study the brains of elderly people have found a specific, relatively small area that can give important clues as to the likelihood of future cognitive decline. The medial temporal lobe is a region near the middle of the brain that includes areas critical to formation of new memories. 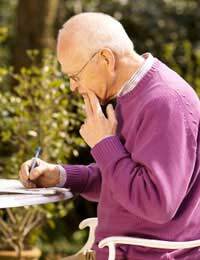 Signs of atrophy in this area seemed to predict memory decline in the older people under study. Of course, the question remains of whether we'd really want to know about it if our memory and other brain functions are likely to decline, or whether we'd prefer blissful ignorance of the future.